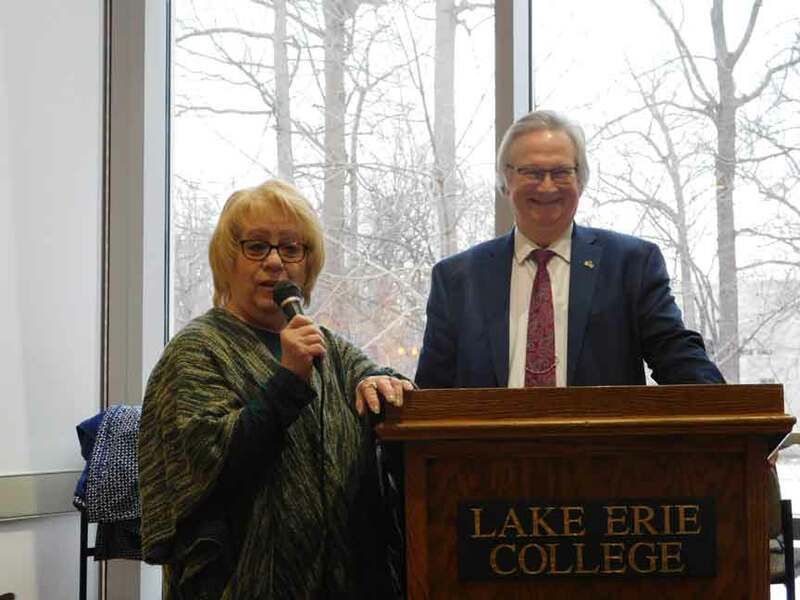 PAINESVILLE – Downtown Painesville Organization’s annual Founder’s Day Breakfast, celebrated Jan. 12 this year at Lake Erie College’s Holden Center, again served as an opportunity to introduce the new officers and share a bit of history with attendees. Deb Remington, past president of DPO, introduced President Maureen (Dolan) Conway, Vice President Bethany Soeder, Treasurer Jackie Bruner and Secretary Stephanie Evans. One program presenter on the topic of the 19th Amendment was Jan Clair, current deputy director of the Lake County Board of Elections, and former director for many years—30 altogether. Her co-presenter was Dale Fellows, president and co-owner of Morgan Litho, Inc. and Eagle Advertising. He also serves on the Lake County Board of Elections. “The women’s suffrage movement really formally began in 1848, when there was a women’s rights convention that was held in Seneca Falls, NY, that was called together by reformers … Elizabeth Cady Stanton and Lucretia Mott,” Fellows said. One year later they organized a national convention in Wooster, Mass. However, women were already taking part in other activities like the temperance and anti-slavery movements, and moral reform. “During the 1820s, ‘30s and ‘40s, many women bristled at what historians called, of all things, the ‘call to true womanhood,’ which was women being the pious, submissive wife and mother, concerned only about her home and family,” Fellows said. He continued to explain how the Civil War, and focus after the war on passing the 13th, 14th and 15th amendments, slowed the Women’s Movement. Stanton and Susan B. Anthony formed the National Women’s Suffrage Association which opposed passage of the 15th amendment because, although it gave black men the right to vote, it did not include women. However, other women, headed by Lucy Stone, formed the American Women’s Suffrage Association, which believed getting women the right to vote would better succeed by working for support from individual states. Women’s suffrage first gained some true support at the Republican National Convention in 1872, with the first constitutional amendment being proposed in 1878. Fellows said the two suffrage associations merged in 1890, headed by Stanton, as the National American Women’s Suffrage Association. He stated women were first given the right to vote in Wyoming in 1869. After a couple more attempts failed, the House finally passed the 19th Amendment May 21, 1919, and the Senate on June 4, 1919. Ratification by three-fourths of the states (36) was completed Aug 18, 1920. Clair provided information on women in politics during the past century. “The Gallup Poll, ranking events of the 20th century were: World War II number one and then women gaining the right to vote was number two,” she said. • 1921: Amy Kaukonen was elected mayor of Fairport Harbor, one of the first female mayors in the country. • 1922: Six women were elected to the Ohio Legislature. • 1923: Mary Bell Grossman was elected as municipal court judge in Cleveland. “In the 1930s we had men that would be stepping down or dying as sheriff and their wives would step in and complete the term,” Clair said. She named the first women in Lake County to be elected as clerk of courts, county auditor, county commissioner, county recorder, probate judge, common pleas judge, domestic relations court judge and juvenile court judge. Clair said women are having more of a voice in elections. Clair noted she was the first female director of the Lake County Board of Elections. Currently, on the national level, Clair stated there were three women on the U.S. Supreme Court; seven holding cabinet or cabinet-level positions; 23.5 percent of the seats in Congress (102 in House and 25 in Senate); 27.6 percent of 312 statewide executive seats; and 28.6 percent of 7,833 state legislative seats. Fellows concluded the presentation by tossing out some political history questions and rewarding those having the correct answers with $100,000 candy bars. Jan Clair, deputy director of Lake County Board of Elections, and Dale Fellows, president and co-owner of Morgan Litho, Inc. and Eagle Advertising, present history of the women’s suffrage movement leading to passage of the 19th Amendment to the U.S. Constitution and women elected to local, state and national positions.